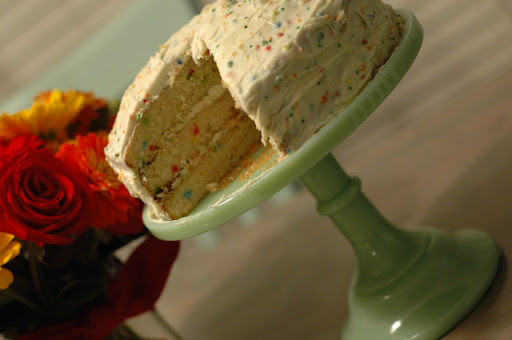 I absolutely adore Funfetti cake. It is the antithesis of what we normally eat. 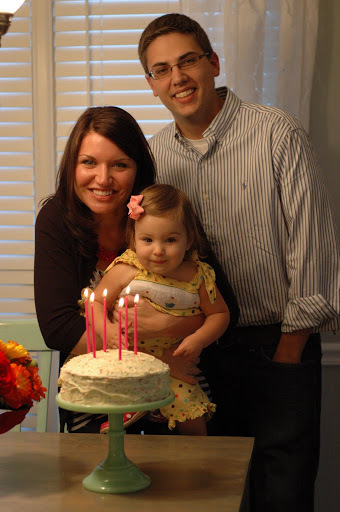 (What with the vast quantities of white flour, white sugar and don’t forget the colored candies…) But every year Matt makes me a Funfetti cake for my birthday, and together we eat every last morsel. Of course, this year L is making a big dent in the cake. 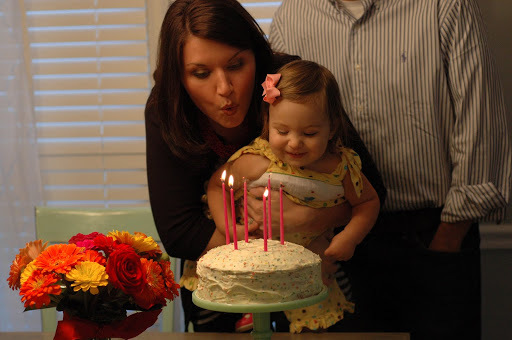 Momma and L blowing out the candles. L thought the smoke was awesome! 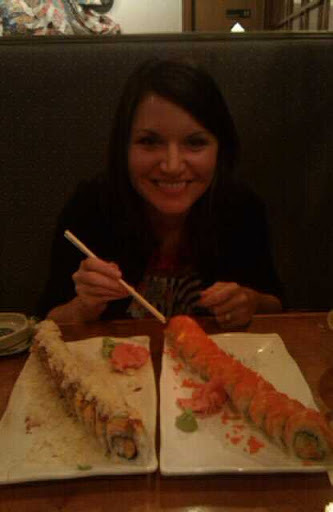 Matt took me out to dinner to get sushi, the most delicious sushi… my mouth starts watering just thinking about it. I didn’t eat all of that. I shared a couple pieces with Matt. The one on the left is the Mexico Roll, a longtime favorite and the one on the right with all the fresh salmon on top is the New Orleans Roll, a new favorite. After dinner we did a little shopping. 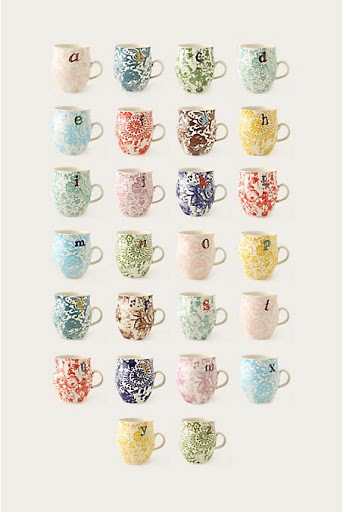 I found a new mug from Anthropologie. When we got home I took a bath, read my new library book and enjoyed my blueberry green tea from my new mug. Mine is the first one on the second row. The main color was aqua blue… perfect? I think so! As a midnight snack (okay, 9:30… did I turn 72?!?) 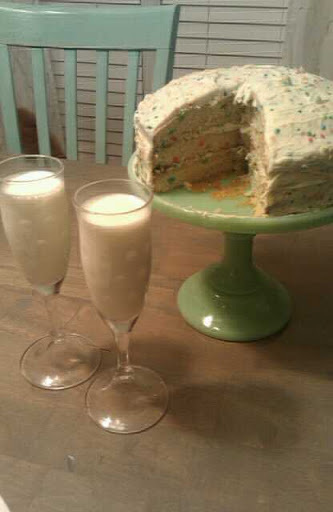 we enjoyed Funfetti cake and toasted another year with ice cold milk. The jadeite cake plate was my birthday gift from Matt. I absolutely love it, and I look forward to many happy memories celebrated with it! 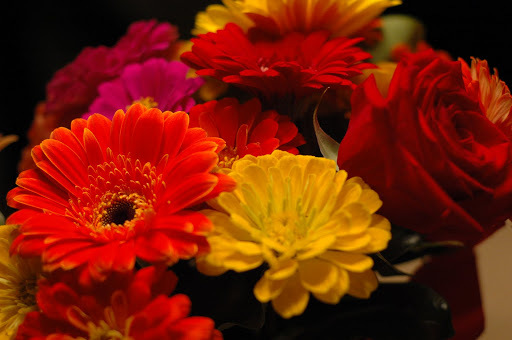 And those flowers you see in the background. My daddy had them delivered to me since he is out of the country this week on a mission trip. They are sooooo gorgeous, and they were the best surprise! I LOVE them! I am a blessed girl, and my greatest blessings are my family and friends. But the reason I live to celebrate another year is my Savior, Jesus Christ. Without Him, life would be nothing.